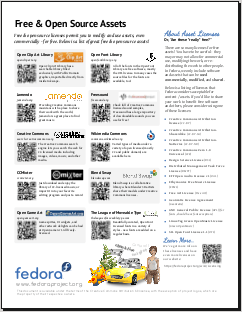 Flyers About Free & Open Source Software for SXSW Creatives! Emily and I are here in Austin, ready for our first day at SXSW. We have been very, very busy preparing materials for our free & open source software outreach to all of the awesome creative folks we can’t wait to meet here. Emily has put together some beautiful use case-centered tri-fold brochures she’s going to blog about for you soon. I spent some time earlier this week putting together the lovelies below which will be available as handouts at our expo booth, #344, starting on Monday. This flyer reviews some of the best sites out there to get freely-licensed assets, such as Open Clip Art Library, Open Font Library, CCMixter, and Blend Swap, among other great sites. This flyer also talks a bit about asset licensing, pointing out that just because something is free that doesn’t mean you can use it commercially, modify it, or redistribute it. It talks about how Fedora requires all three of these things to accept content, and goes over some of the Fedora-approved content licenses. We’d love to get more awareness for these awesome collaborative sites and hopefully inspire some SXSW-goers to join in and collaborate in creating high-quality content for these sites as well. What Can Free & Open Source Software Do? This flyer reviews some great works done by creatives using free & open source creative tools, including the Blender Institute’s films (Sintel, Big Buck Bunny, Elephant’s Dream). With this flyer, we’d like to show that free & open source tools really are capable of producing amazing, professional-quality, and beautiful works. 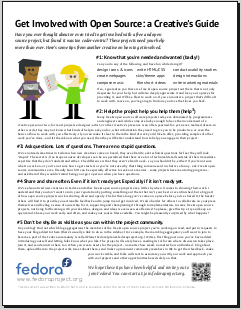 This flyer is a reprint of some of the interviews we did of actual Fedora users for fedoraproject.org‘s recent redesign. 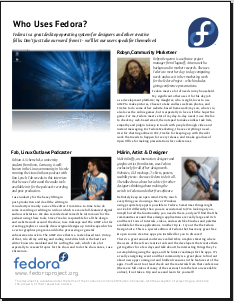 We wanted to put a face to some of the creatives already using Fedora, talking about how they use specific free & open source creative tools that are available in it to produce their works. Guess Who Uses Free & Open Source Software? 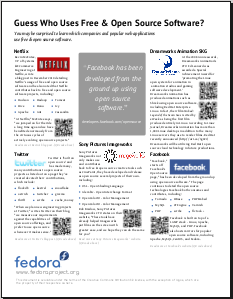 In this flyer, we call out some of the big creative and interactive companies and brands that use open source. In researching this flyer, I was impressed to see how many projects Sony Pictures ImageWorks have open sourced, including what appears to be a color management system. They also use Cinepaint! They are one of the examples on the flyer. Here’s five tips for creative-minded folks who’ve thought about helping out a free & open source software project but weren’t sure where to start. A lot of free & open source communities are still quite centered around developers and other technical folk, so this was our attempt at writing something specific for creatives and addressing the particular challenges and cultural issues they might face in trying to get involved. Even if you can’t be at SXSW, I hope these materials are interesting and useful, and show how awesome free & open source tools and culture really are. If you’d like to remix them, the Inkscape sources are available. These flyers are available under a Creative Commons Attribution 3.0 license except for particular elements which are called out in the footer of each individual sheet. Thanks for the corrections Joachim! That looks great. You (single/plural) are doing great work, thanks! Two imho remarks: I don’t get the girl/car/dog/plant/music part. It looks out of place compared to the previous content. The last one (“Creative’s Guide”) could use some of the secret sauce of the previous ones. For a Creative Guide it looks rather boring :- ) Just a lot of reading and not much fun. The picture is also not very inspiring/inviting to wade through all the text. Thanks Pieter! The Girl/car/dog/plant/music was just an attempt to decorate the page with some of the elements from all of the different sites we were highlighting but maybe it wasn’t the right thing to do. I agree the creative’s guide is too dense; it was the last one I did (at, you know 11 PM before I had to get on a plane in the AM) lol so you’ve definitely done a good job at identifying it as the weakest in terms of visual design. 🙂 Cheers! Magnificent ! Your flyers show many features I didn’t even know about and I have been using and contirbuting to open source software for years now. I love the positive attitude and vibe of your work. Thanks for that. What’s with the scantily clad women? don’t you think this is a bit sexist? If you examine the piece, you’ll note that it’s part of a campaign to promote breast cancer awareness and encourage women to self-check. I actually support the work of the folks at Geek Feminism. Please don’t forget to mention Celtx, which is quite possibly the most capable and flexible screenwriting program of all, and Open Shot which right now is a sort of consumer-focused video editing program but has the power of Blender behind it and will get some more professional features in the future. Awesome, thanks for the tips Michelle! I hadn’t heard of Celtx before but it sounds quite awesome. I’ve been using Open Shot a lot lately so I’ll mention it to folks as well!